THE GRAND PARADE is the only bi-state St. Patrick's Day Parade in the USA and is viewed by tens of thousands of people along the route from Rock Island, Illinois across the Mississippi River through Davenport, Iowa. A Mass at St. Mary's Church, Rock Island, IL is celebrated at 10:00 am. 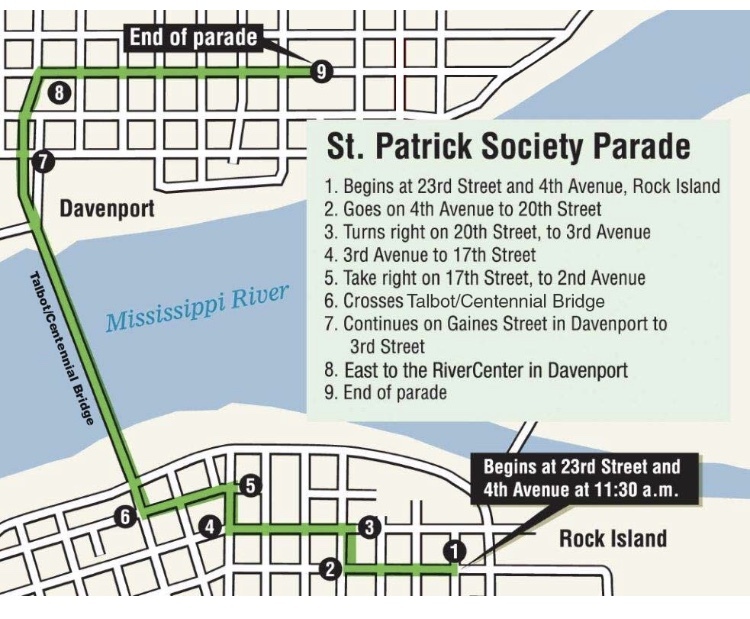 The parade begins at 11:30 AM at the corner of 4th Ave and 23rd St in Rock Island and winds its way west thru downtown Rock Island following 4th Ave to 20th St to 3rd Ave to 17th St. to 2nd Ave. to the Talbot/Centennial Bridge, where it crosses the Mississippi River to Gaines St. in Davenport and then north to 3rd St. and east on 3rd to the River Center. Parade organizers are most interested in participants expressing the spirit of St. Patrick, including marching bands, musical groups, decorated floats, novelty entries and walking units, especially Irish family walking units. The parade is already at its limit for cars, trucks, and vans. For safety reasons, throwaways from parade participants are not allowed. The Society also strictly prohibits the distribution by Parade participants of any paper items including, but not limited to, brochures, leaflets, flyers, and coupons. Once again the St. Patrick Society and River Bend Foodbank are teamed up to fight hunger in the Quad Cities. In the 22 counties served by River Bend 22 million meals are being missed; our goal is to close the meal gap in our community by 2025. During the 2019 Grand Parade, River Bend collected $2,710 from very generous spectators along the parade route. That will provide 13,000 meals in the fight against hunger in Eastern Iowa and Western Illinois. The St. Patrick Society thanks all those who gave to the River Bend Foodbank!